Admittedly, I’ve never seen reason to subscribe to any sort of streaming service, but the upcoming DC Universe initiative may change that. Boasting animated series such as Young Justice: Outsiders and Harley Quinn, the live action side of things won’t be ignored either, for Titans, Doom Patrol and Swamp Thing are also along for the ride. Needless to say, that’s a whole lot of incentive to sign up. Aside from knowing that Titans is set to premiere on Friday, October 12th, though, we’ve been left in the dark when it comes to the various other sister series. And though kickoff dates for the rest still remain a mystery, the months when each will debut have finally been disclosed. Thanks to the infographic seen below, the broadcast calendar for the 2018-19 period is on display for all to see. 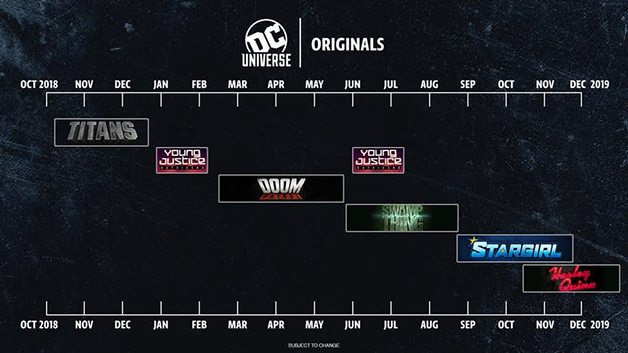 Knowing that Titans‘ first season consists of 12 episodes that’ll drop on a weekly basis, it makes sense for it to wrap up shortly before January. Speaking of January, that’s when we’ll finally bear witness to the eagerly anticipated return of animated favorite Young Justice, as Outsiders looks to be split into two halves for consumption. On the plus side, though, the second leg in the journey will arrive in June, so that’s not too bad of a hiatus at all. Picking up the slack during the break period will be that of Doom Patrol, a Titans spinoff spanning from February through May. The characters making up this one may be a bit more obscure, sure, but there’s a lot of hype surrounding this bad boy. From the look of it, Swamp Thing will immediately follow in late May or early June, before concluding in late August. If you were to ask me, this could end up being the crown jewel of the streaming service if pulled off properly. Hey, if the source material has been written by the likes of Len Wein, Alan Moore, Nancy A. Collins and Scott Snyder, then half the work has already been done for you. Then, in late August, Stargirl will commence, thereby bringing Geoff Johns’ cult favorite to life. Set to conclude in late December, this production will show us whether a character who’d previously played a minor role on Smallville and Legends of Tomorrow can carry her own show. Getting back to animation, Harley Quinn brings up the rear by premiering in mid-October and carrying over into 2020. Personally, I’m really looking forward to this one, as the first teaser trailer hints that the creative minds have found the proper tone. Beyond that, there isn’t much else to discuss, but we do know that Titans is guaranteed a second season at the very least. Common sense dictates that early 2020 is the most likely time for that saga to resume, but we’ll bring you more info as it surfaces. For more on what to expect from DC Universe, be sure to check out our review for Titans‘ first season.